being me ended up with a Moana yes singing satchel. No one, I mean no one, can resist a Disney store sale! Even when you have to admit it's secretly for you when you get to the counter; busted! 1. Run and Fly dress - This is the dino dress of dreams! I found a mustard version of this baby in the shop Harper and Lewis and managed to convince Mitch that I read definitely need it for my birthday. 2. Topshop Broderie Ruffle mini dress - This beautiful white number from Topshop is so dreamy, I love the prairie vibes and flared sleeves, just perfect. I would definitely buy it on my birthday and wear it under the dino dress as a petticoat, I have a feeling they might look cute together. 3. Too Faced prismatic highlighter in Ray of Light - I was recently able to swatch these babies - one of those days where you go round with glittery mermaid arms from the Debenhams beauty department! They are all so beautiful and nicely pigmented, despite having more of a glittery finish, rather than a dewy one. There are three shades but I was immediately drawn to Ray of Light, a beautiful rose gold. 4. Disney store Moana Pua plush - It's Pua! Next time I go to a Disney store I'm not leaving without adopting one of these cuties. Have you ever seen a cuter plushie? Those silky ears - and little trotters! 5. Philosophy shower gel - I think this gel has been renamed 'Peaches and Fresh Cream' and is very difficult to find on the web, but it sounds amazing! I did managed to find a listing on ebay here but would love to have a go at making my own peach and caramel scented soaps and lotions, inspired by this baby. PS the recipe on the side sounds incredible, peaches and instant vanilla pudding mix, oh yes. 6. Chicwish Delicate Forever dress - I love the prairie feel of this dress, it carries such romantic, mid 19th century vibes with the technical term poofy sleeves and fit and flare waist. I love the pleats in the skirt and the pattern is so dreamy and dainty. Perfect picnic attire or for a modern vintage outfit. 7. Chamilia Moana sailing charm - I'm a Pandora girl at heart but I can't stop lusting over the Chamilia Disney Moana collection, the charms are so darling! Hopefully they will still fit my Pandora bracelet, has any one else had experience of mixing and matching the charms? Let me know! 8. Victoria's Secret Pink Sunset lotion - We recently popped in to the Birmingham store when staying down with Mitch's family and I was able to give the Pink Sunset body mist a spray, it's gorgeous! The juiciest ever scent, somewhat like fresh pineapple and watermelon, it was sumptuous. I ended up picking up the Island Sun spray, starfruit and coconut water, £5 in the sale, but would love to get the lotion in this scent. 9. Aquascutum Penryn trench coat - Despite the recent scorching weather, I have long been in need of a raincoat. After a bit of searching I got sidetracked by this gorgeous trench style coat that would easily see me in to autumn too. It would perfectly compliment any outfit and it's just so chic! This green blue one is so cute too, lightweight and perfect for taking on those little summer and autumn adventures. 10. Too Faced Melted Latex in Unicorn Tears - Such a funny name! This is a shade I wouldn't normally go for with my warm complexion, but it's the perfect mermaid shade and I can't resist. I'm so excited about the new Latex formula also so can't wait for the release; probably one of those items that won't suit me but I will wear every day because I adore it haha. Anyone else have those? 11. Voyager Moana Funko pop - This Moana Funko Pop is my favourite, complete with flower crown and oar! It's my favourite outfit of hers, so beautiful and taken from one of the last scenes of the film, where Moana's people return to voyaging. It gives me goosebumps every time, it's so powerful. You can see a snap of my Moana satchel here! I feel, as if collecting Moana merchandise, I might be able to channel some of her spirit, bravery and somehow be instantly transported to the South Pacific. This is all so cute and pretty! I especially love numbers 2 and 6. I really want to try that highlighter! 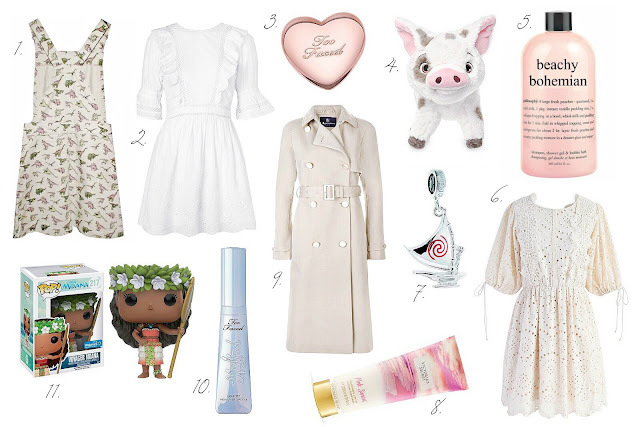 Such a pretty wish list! I love #2 and that trench! Wow, the Topshop dress is gorgeous! It's almost sold out on the website though, I understand why it's so popular. The Chicwish dress is beautiful too, you know how to pick the prettiest princess dresses! Such a beautiful wish list, Elizabeth! I thoroughly enjoy your blog posts, my love - they're always so well-written and well-put-together!! Love your wishlist, speccialy 2,3,5,8! That Moana Pua plush is so cute! I shall mentally remind myself to purchase that online for the next friend I have with an upcoming birthday. Great picks dear, that pua stuff looks so fluffy! Love the dresses. So pretty! So many wonderful picks. I love that you love Moana, she is my inner spirit. I'm obsessed with her and I just adore every Moana merchandise item you have listed in this wishlist! I really want to get my hands on that charm too, I'm hoping to get it for my 21st birthday! Lovely list of summer wish list. Beauty & fashion lovers’ girls of our consultancy would surly like your pretty wish list whom I am providing 100% original, custom written and plagiarism free dissertation writing help on various subject such as nursing - http://www.dissertationhelp.uk/nursing-dissertation/, business, marketing, finance and economics at Dissertation Help UK as I am a dissertation writer or tutor. And I like your nice piece of writing and enjoying reading this article. I am bookmarking your site and surly come back here to get good stuff like this! Keep it up!